Rep. Reed’s Problem Solvers Caucus Hasn’t Solved Any Significant Problems. But, It Might. 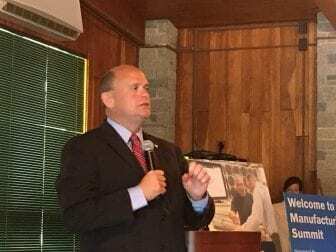 Rep. Tom Reed (R-Corning) at his manufacturing summit this summer. So far, that’s not happening, but it could happen soon. They kickstarted five years ago, but “the Problem Solvers Caucus has yet to solve a significant problem,” said Mike DeBonis, Congressional reporter with the Washington Post. “They’ve been around. They’ve been this group of centrist lawmakers in both parties and they’ve sort of gotten involved in a number of debates including immigration, including the healthcare mess last year,” said DeBonis. They may not boast a bumper crop of bills, but if the Problem Solvers do decide to put forth proposals, they’ve got a plan to change the rules about how to get those bills debated. New rules about rules? Yeah, it sounds pretty bureaucratic. But, it’s important stuff. Read more context on the changes below and the working draft of their proposal at the bottom of the page. Congressman Reed says, over the years, committees have controlled less and less, while the leadership of the majority party and the executive branch has controlled more and more. Leadership decides what bills go up for debate, if at all. However, if these rules are not accepted, Reed and a handful of other representatives have a plan. But, is Reed likely to actually withhold support for a House Speaker? Are these proposals likely to get passed? “Well, that’s a good question,” said DeBonis. A lot of the members of the Problem Solvers are in difficult re-election battles, he said, particularly the Republicans, so it could be a case of big talkers. “Using their leverage in a Speaker vote, that could be very meaningful, especially if it’s a very close majority and that could force some concessions,” said DeBonis. Tremendous pressure from the party meaning leadership could threaten them with crummy committee assignments or withholding money for their re-election campaigns, according to Jim Twombly, political science professor at Elmira College. The Problem Solvers have proposed a dozen changes. One would require a bill be forced into consideration if it has big, bipartisan majority support (Goal II). “That could lead to, for instance, action on things like immigration… where there’s a big bipartisan consensus that never seems to come up because the majority party leadership doesn’t want to do it, so that would be meaningful,” said DeBonis. Meaningful, but he also calls these changes incremental. Another proposal from the Problem Solvers addresses the “Motion to Vacate the Chair,” where any House member can call for an up or down vote on the Speaker (Goal I). Their proposal would make it harder to vote out a Speaker. “That really became an issue about three years ago in 2015, when the Freedom Caucus had just gotten started, this group of very hard-right members who weren’t happy with the Speaker at the time, John Boehner,” said DeBonis. Reed and other members of the Problem Solvers Caucus say they hope these proposals will decrease the likelihood of a House Speaker getting “held hostage,” decrease the power of party leadership, and increase the power of rank and file members. But again, stay tuned for whether they’ll pass. “These rules will have a very difficult time passing because the very people who they’re designed to circumvent have to rule on this proposed packet of changes,” said Twombly. That being said, even if this set of proposals doesn’t get passed, Twombly said, they’ve started an important conversation.